Emerson offers field-proven Micro Motion Coriolis flow and density meters for a wide range of LNG, CNG and LPG applications, from basic flow measurement to precision measurement in challenging applications. With over 100,000 installations worldwide, the Micro Motion CNG050 meter for compressed natural gas (CNG) and the new LNG Measurement System for liquefied natural gas (LNG) are the meters of choice for the leading dispensing manufacturers. Micro Motion LNG Measurement System with LNGM10 LNG meter – designed for LNG fuel dispensing. Emerson has recently released the new Micro Motion LNG measurement system specifically for LNG dispensers that serve the car and bus market. This innovate package is the first to incorporate two separate Coriolis meters with a single, integrated transmitter. Traditional LNG meters only measure the liquid LNG supply to the vehicle but do not take into account the boil off gas (BOG) which is returned back to the holding tank. This new LNG metering system helps customers achieve a true mass balance measurement to ensure the proper amount of fuel is being delivered as promised, all with the inherent reliability and low maintenance that come with a Coriolis meters. The new LNGM10 Coriolis mass sensor, which measures the liquid-phase LNG into the vehicle has been designed and optimized specifically for LNG. Micro Motion CNG050 CNG meter – designed for CNG fuel dispensing. Emerson’s Micro Motion Coriolis meters offer excellent mass flow measurement accuracy and, because the meter has no moving parts, ensure increased system reliability, maximum operating uptime, and minimal operating cost. A single device can supply flow rate, density, and temperature information allowing operators to monitor LNG and CNG state during filling without the need for separate devices or off-line sampling. 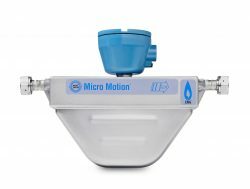 Micro Motion direct mass flow measurement eliminates the need for the separate fluid density compensation required by traditional volumetric technologies. This reduces costs and measurement uncertainty while simplifying installation. Additionally, Micro Motion meters are not impacted by flow profile, eliminating the need for straight pipe runs or flow conditioning devices, enabling compact and efficient skid based metering designs. MID Certification means that when these compact flowmeters are used as a component of a complete measuring system, such as a fuel dispenser, it is not necessary for the dispenser manufacturer to type test and certify the devices – saving both time and money. Independent validation confirms that the Micro Motion factory calibration transfers directly to LNG and other cryogenic applications. 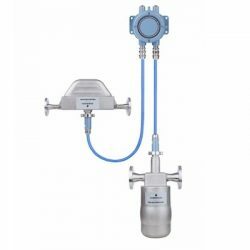 This eliminates the requirement to establish methods of verifying calibration performance on cryogenic fluids as is necessary with alternative, volumetric metering techniques. Emerson is a world-leading supplier of process automation products, technologies and services that help companies increase plant availability, improve quality and reliability, and maximise profitability.